Quite simply, the land of Bermuda shorts is long on charm. Bermuda's rare combination of natural beauty, British heritage, and a range of unique accommodations, dining, and shopping options make it a perfect (and convenient) destination. The islands diminutive size--just 22 square miles--allows visitors to easily enjoy the entire island. Bermuda actually consists of about 120 islands and islets extending northwest to southwest. This fish-hooked chain is situated in the Atlantic Ocean, 650 miles east of Cape Hatteras, NC, and a short flight from the eastern United States. Island charm is everywhere, with homes painted the color of sherbet, businessmen wearing Bermuda shorts and ties to work, and streets and homes bearing names like "Old Maids Lane" and "Fanny Fox's Cottage." Bermuda's background is distinctively British, though the island's history has led to many local touches. Spanish explorer Juan de Bermudez sighted and landed on the island in 1503, but did not settle there. Admiral Sir George Somers, whose ship Sea Venture was carrying colonists to the new British colonies of Virginia, wrecked off the Bermuda coast near the present-day town of St. George in 1609. He claimed the island for England. The first meeting of the island parliament, the oldest Commonwealth legislature outside Great Britain, was held in the State House in 1620. Located in St. George, Bermuda's State House is the oldest in the Western Hemisphere. By the 18th century, Bermuda had become an important part of the British empire. However, this loyalty was severely tested during the Revolutionary War, when many locals supported the island's neighbor colony, Virginia. Since the first royal visit by Princess Louise in 1883, Bermudians have been welcoming vacationing guests. Today, the island is divided into nine parishes. From east to west, the parishes are: St. George's (including St. George); Hamilton (not the city); Smith's; Devonshire; Pembroke (including the city of Hamilton); Paget; Warwick; Southampton; and Sandys (Somerset, the West End). St. Georges and Pembroke (with Hamilton) are two of the most popular for exploration. The parish of St. Georges is the most history-rich parish. The town of St. George, founded in 1612, provides a colorful contrast of present and past. Huge cruise ships often tower over the quaint town and its full-scale replica of the Deliverance, another 17th century ship of Sir George Somers. The center of St. George is King's Square, which served as the seat of Bermuda's courts and General Assembly until 1815, when the capital was moved to Hamilton. Nearby, its hard to miss the tastefully reconstructed Town Hall, where the parish government is still situated. St. Peter's Church is a stunning and awe-inspiring whitewash building. Its the oldest Anglican place of worship in the Western Hemisphere. Steep Slippery Hill leads to the Unfinished Church of St. George's, which features a great view and an unfinished 19th century church. It's a downhill stroll back down to town or an enjoyable walk out to Fort St. Catherine (about four miles). Transportation to this fort can be arranged back at King's Square. Along with taxi tours, the fort is also easy to reach by bicycle or moped. Pembroke Parish draws many visitors to the cosmopolitan city of Hamilton, but there is much more to this area. The city was founded in 1790, but remained quite small until the government seat was moved there. It's size is still small enough for exploration by foot, though a taxi or carriage tour can be an enlightening addition to time in Hamilton. The best place to start is along the water on Hamilton Harbour. At the corner of Front and Queen Streets, the "Birdcage" sits in the middle of the intersection--where sometimes there's an official directing traffic. On Church Street is Hamiltons modern City Hall. It opened in 1960 and features a large white tower with a bronze white replica of the Sea Venture. Inside, the Bermuda National Gallery has an excellent collection of artwork. Nearby on Court Street is the Sessions House. Bermuda has the third oldest parliament in the world, behind Iceland and England. Court Street leads back to Front Street for a tour of the Cabinet Building and Senate Chamber. Past visitors have included Sir Winston Churchill, President John F. Kennedy, Queen Elizabeth II, and Prime Minister Margaret Thatcher. Front Street leads back to Hamilton Harbour. The world-renowned shopping is the biggest reason to enjoy Front Street and neighboring streets. 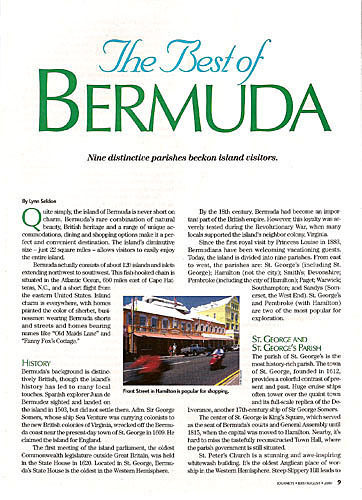 There's much more to Bermuda than the parishes of St. George's and Pembroke. Southampton Parish is renowned for world-famous beaches, such as Horseshoe Bay Beach, but there is also much history to explore. The South Road leads past the pretty pink Southampton Princess to the turn for Gibb's Hill Lighthouse. This famous 1846 lighthouse offers great views from the base and even more spectacular views at the top of its 117-foot tower. Warwick Parish is home to several great golf courses, beautiful beaches, and some out-of-the-way spots that not many tourists take the time to visit. To the east of Warwick sits Paget Parish, with more pleasant beaches and other possibilities. The first stop in Paget should be the Botanical Gardens and Camden. The beautiful gardens lie on 35 acres, which include Camden--an 18th century home that is now the official residence of the premier of Bermuda. On the other side of Pembroke Parish and the city of Hamilton, Devonshire Parish provides a quiet respite. Highlights include the view of Bermuda from Ft. Langton, golf at Ocean View Golf Course, and Palmetto House. Smith's Parish is one of the quietest areas in Bermuda. Here, the village of Flatts was supposedly named for the shallow water in the harbor. Hamilton Parish (not to be confused with the city of Hamilton) is reached as soon as you cross Flatts Bridge. The Bermuda Aquarium, Museum and Zoo is well worth a stop. The Bermuda Perfumery also can be found in Hamilton Parish. Take a tour of the gardens and factory then continueon to Swizzle Inn, one of the island's most popular spots for rum swizzles. 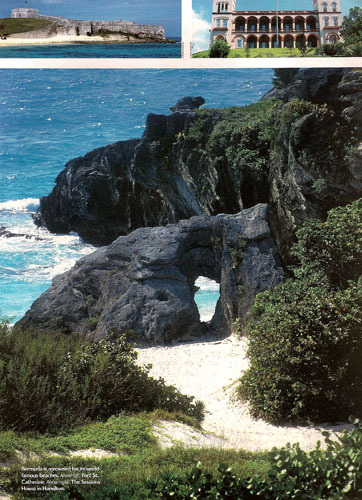 Sandys Parish, referred to as the West End, is the perfect place to try the Railway Trail, which follows an old route of the Bermuda Railway Company's train track that once spanned the entire length of Bermuda. The most popular destination in the West End is the Royal Naval Dockyard. Gates to the dockyard opened to the public in 1951, ending almost 150 years of service as the base of Royal Naval power in the Western Atlantic. Many old naval buildings have been converted into museums, restaurants, shops, and workshops.